Big-Box Retailers Move To Smaller Stores In Cities Big-box retailers, including Target and Wal-Mart, started by building their discount businesses out where land was cheap and space was plentiful. But now they have big-city plans for smaller stores in places like Chicago, Los Angeles and Washington, D.C. 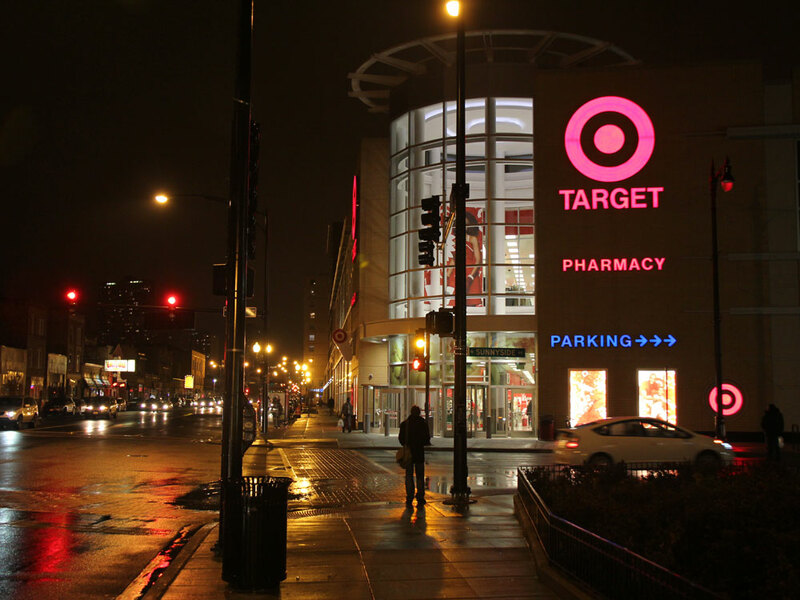 The Target store in Chicago's Uptown neighborhood opened this past summer. It's part of a mixed-use development, which includes modest apartments and other retail shops. In Chicago's diverse Uptown neighborhood, Target last July opened a brand new store with a twist on its usual business model. The Wilson Yard store is near a Red Line L stop and right on a bus line, providing easy access to public transportation. Parking is underneath the store rather than taking up room out front. Pedestrians walk right next to the building, looking in the windows as people once did with Target's downtown retail ancestors. Target and Wal-Mart are known for their efficiency in getting trucks in and out and replenishing the shelves. They combine that logistical expertise with low overhead to keep prices down and still turn a tidy profit. But that’s not as easy in a big city, where real estate is more expensive and underground parking is much pricier to build. Trucks can get caught up in traffic. Smaller sales floors also make it harder to showcase a variety of products. Despite these obstacles, both companies say that prices in their urban locations won't be higher. Casey Chroust, executive vice president of the Retail Industry Leaders Association, says the key to that is going to be volume. "There are more people in closer proximity that can take advantage of buying from retailers" in dense cities, he says. "And it’s really selling through those products more quickly." Ellen Dunham-Jones, a Georgia Tech architecture professor who has written about big-box development, says it will be very interesting to see whether Wal-Mart or Target has the more successful urban strategy. "Walmart is seen more as a store that people stock up on necessities, whereas Target is more about discretionary spending, where people find the hidden treasure," she says. Dunham-Jones says a lot may depend on the neighborhoods where these stores end up. Target will have to compete against many urban stores that already sell hidden treasures. And Wal-Mart's challenge will be whether it can maintain its reputation for inexpensive products when it is operating in smaller stores with far less inventory. Sunda Obendorf is the store's "team leader," Target's term for manager. The store is Target's "cookie-cutter" size, she says, at 126,000 square feet. But to make it fit in a densely packed urban area, the space is stacked up on two floors. People ride escalators up and down alongside their shopping carts. Shoppers "love the cart escalators," Obendorf says. Many of the store's shoppers don't come in a car. But people who buy large items like furniture don't have any trouble getting it home. They just hail a cab. "I've never seen so many people flag down cabs," Obendorf says. "The SUV cabs make a lot of stops out front here and load up a lot of furniture and things. It's pretty cool, really." Most of the merchandise is what you'd expect to find at a Target, but this store was also on the leading edge of the chain's aggressive push into grocery sales. Right next to the cosmetic aisle is the stores' "P-Fresh" section, featuring fresh produce. Obendorf says this is a "nice chunk" of the business at her store. And she says you can get a sense of the store's diverse customer base here. She is working to meet demand for items suburban Target groceries don't typically stock: plantains and greens, for instance. Big-box retailers like Target have realized the need for a new business model. Casey Chroust, executive vice president of the Retail Industry Leaders Association, says one reason these chains are moving into cities is that many suburbs are already chock-full of Targets and Walmarts, not to mention Kmarts or PetSmarts. "The urban markets are really the last frontier yet to be conquered by retail," Chroust says of the big-box chains. "And as some of their traditional marketplaces become saturated, they are trying to move into some of these additional areas to take advantage of them." Retailers also say online sales and credit card purchases at suburban stores tell them that they already have customers in big cities. So they're chasing them down and hoping to add some new ones. 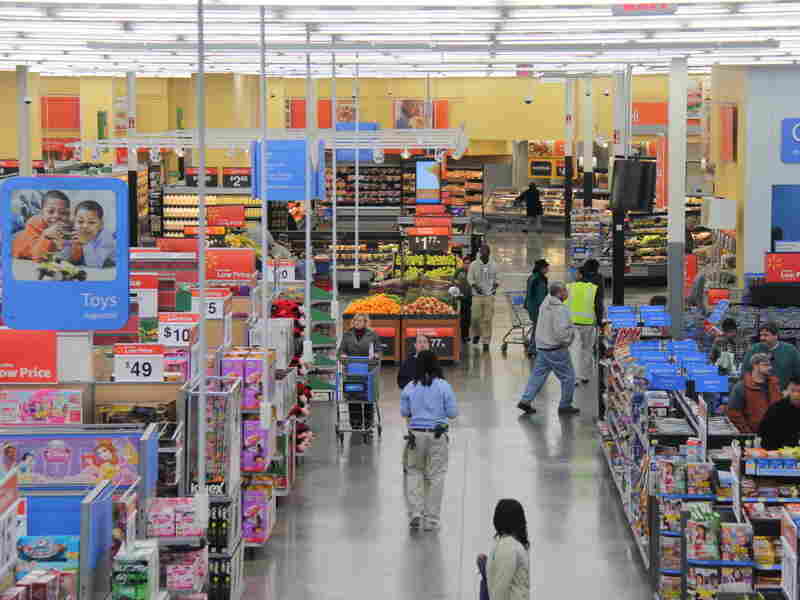 In Fairfax County, Va., a new Walmart opened a few weeks ago that's a kind of a middle ground in urban experimentation. It's on thickly congested Route 1, just outside Washington, D.C.'s Beltway. It's not in the heart of a city, but it is in a close-in suburban area with a real mix of incomes and ethnicities. The new urban Walmart in the Alexandria section of Fairfax County, Va., sports a small floor plan with a significant grocery section. It's easy to see from one end to the other. Outside, the store is what you would expect. There is a big parking lot in front, and Chuck E. Cheese's occupies the space next door. But inside, this store is a Walmart on the cutting edge. Steven Restivo, Wal-Mart's director of community affairs, says this store is smaller than people are used to seeing in a Walmart -- it's just 80,000 square feet. That's less than half the size of some Walmart Supercenters. But it's still large compared with some of the company's future urban floor plans, which could run as small as 30,000 square feet. Target has also said it plans to build some smaller urban stores. Restivo says this Walmart doesn't have "the traditional lawn and garden offerings that we would have in a larger store. Some of those areas are cut back a bit." But he points out that it still has a full grocery offering. There's "a large Hispanic population in the surrounding community," Restivo says. "So, signage is bilingual. And also in this store you have an entire aisle dedicated to international foods." Again, the grocery section is a key to an urban model. Retailers say it keeps people coming in more frequently. City officials say it's a good way to address a long-running urban problem: food deserts. That is, areas of the city without access to fresh food. Wal-Mart is planning to build four new stores inside Washington, D.C. One would go up in Ward 5, where Harry Thomas Jr. is the city councilman. Thomas has been holding meetings about the proposal with the community, with Wal-Mart and with organized labor. At a community meeting earlier this month, Thomas tried to suss out neighborhood concerns, and he told people why he thinks this is part of the answer for his underserved community. Along with the grocery, he says the store will create 300 jobs. The stores that go in around it should create 600 more. Thomas also says this should help keep city money in the city. Right now, he says "there's $41 million ... that we know that people from the District of Columbia are spending [at Walmarts] in the surrounding jurisdictions." Community activism and union opposition have kept Wal-Mart out of D.C. and some other cities in the past. At the Ward 5 community meeting, residents posed questions to councilman Thomas, Wal-Mart representative Keith Morris, and developer R. Richard Walker. Will local people be hired? "Yes." 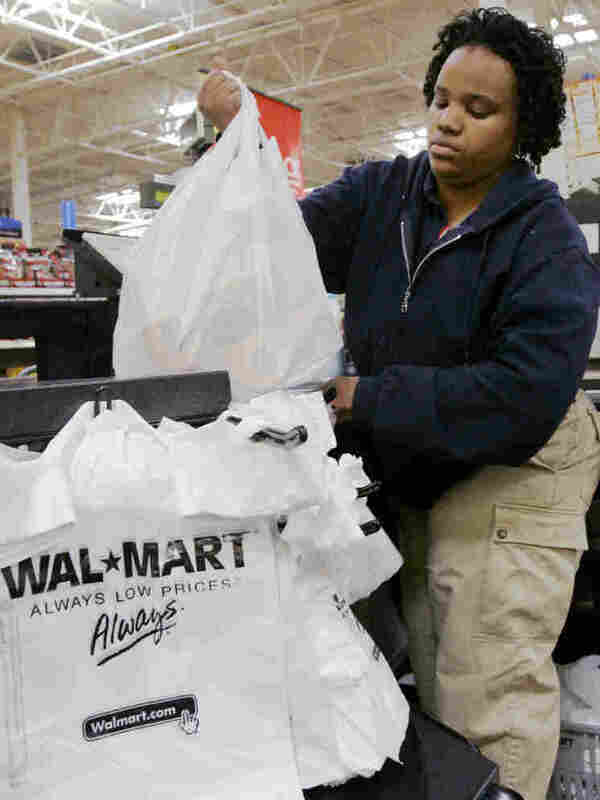 Will Wal-Mart invest in the community? "Yes," again. Would prices be higher than they are in the suburbs? "No." There was some skepticism. Several people wanted those promises in writing. But at this particular meeting there was no one who voiced total opposition to Wal-Mart. Still, some community activists are opposed, and they are trying to organize against Wal-Mart's plans. In another part of the city, about 20 people showed up at the home of a developer last week to protest a planned store for Ward 4. Zein El-Amine is a part of the group called "Wal-Mart Free DC." He says this kind of development "shreds the fabric of the community," lowering wages and running small, independent stores out of business. Wal-Mart disputes these points. But El-Amine says when it comes to development, cities must "think outside of the big box." In the Columbia Heights neighborhood of Washington, D.C., there's a shopping complex called DC USA. It includes the city's only Target store. In format, it is similar to the Target at Wilson Yard in Chicago: It is right next to a subway stop and features multiple stories, cart escalators and a grocery section. The area is bustling, surrounded by other stores and restaurants. There is no doubt that the Target and its neighbors have been a catalyst for neighborhood gentrification. The city's director of planning, Harriet Tregoning, says this is all really about a much bigger trend. "A lot of people are moving back to the cities," she says. "We've seen some very substantial population increases in the last several years -- nearly 10,000 last year alone, the largest annual increase our city has seen since World War II. So, I think in some ways they're following their customers back to the city. And they're also saying, 'Here's a largely underserved market. Why don't we see if we can figure out a way to be urban and crack into a whole new market?' "
Suburban big-box stores have long evoked groans from architects and urban designers. They are infamous for bland style, and their sprawling formats spark frequent complaints about sustainability. Ellen Dunham-Jones, an urbanist and architect at Georgia Tech, has written about a need to "retrofit suburbia" -- to be more densely developed, rather than continuing to build suburbs farther and farther out from cities. When it comes to this kind of business moving into a city, she says: "There has been a lot of concern about the suburbanization of urban retail." But, she says, if big-box stores move into blighted or underused areas of a big city, that's positive, especially if the stores are smaller. "To the degree that it's infill and or reusing existing buildings, it's still retrofitting," Dunham-Jones says. "And from that larger regional perspective, [it's] a good thing." "It makes you want to come out and spend a little money if you don't have any anyway," says Washington native Niecy Stevens, whose car was parked at the curb in front of the store. "So, it brings people together, I guess." But neighborhood resident Anne Bouie, who lives nearby, says she is "conflicted." "I love Target; I'm not going to lie," she says." I'm in there every week. But they're soul stealers from communities like these. ... I mean, look at this. Does this have any spin, any flavor, any style by any criteria?" As more Targets and Walmarts pop up in places like this, the overarching question is whether big-box retail can adapt to fit in a big city.